Once in a while in my long career as a movie fanatic I come across a sparkling gem that reminds me there’s still so much to see, so many places to go, for Indian cinema. First-time feature filmmaker Milind Dhaimade takes us into places where we all have visited at one time or another. And I don’t mean only Mumbai which like many memorable films stands a silent hero in this film about unsung heroism. Dhaimade—God bless his creative juices that flow in the narrative like a stream gurgling through a craggy mountain—takes us to places in the heart where we go quite often in seclusion but don’t really wish anyone else to know. 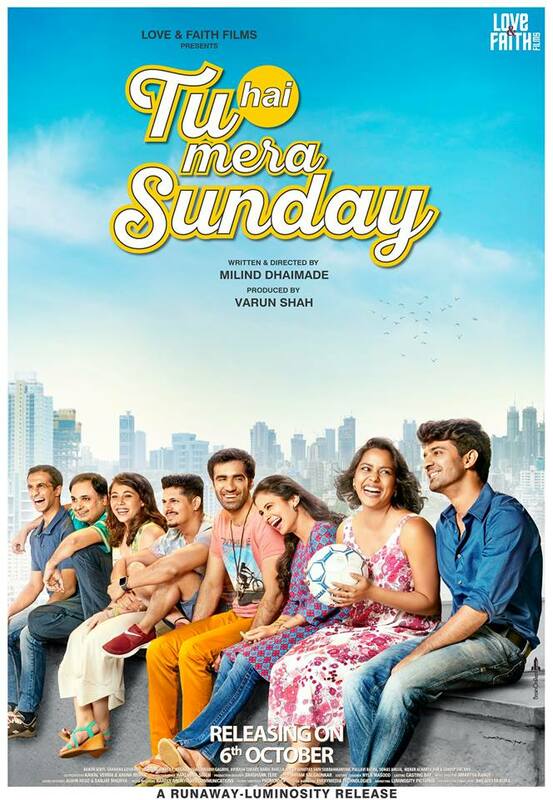 The oddly entitled Tu Hai Mera Sunday is about working class yearnings, crushed dreams and smothered aspirations floating to the surface to confront the characters even as they conform to the stagnating status quo, loath to swim against the tides. Some of the major characters, and there are so many of them all so vivid and relatable even in the briefest of roles, have serious meltdowns in unexpected moments. And if the others don’t break down we know they are holding it all in. The cloudburst can happen any time. It’s the sunshine that director Dhaimade and his astounding cinematographer Harendra Singh focus on, but never at the cost of the darkness that lies beneath. The overbridge on which we first meet the five protagonists could be the ill-fated venue of tragedy that happened on Elphinstone Road in Mumbai recently. There are no traces of crisis where our heroes first appear. But then this is Mumbai. Everything changes in a jiffy. 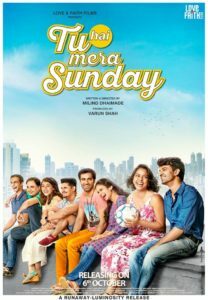 It is this mix of mirth and melancholy that makes Tu Hai Mera Sunday one of the most precious slice-of-life films in recent times. The narrative shifts moods and tempo without disturbing the characters’ journey and thought processes as they go from smothered anguish and despair to a celebration of life and related joys. The core theme is the five protagonists’ search for space to play their Sunday football game, an event that centralizes their scattered lives. Even as they grapple with personal issues, all delineated with remarkable fluidity and grace, the sportive spirit binds the five friends through personal pain and shared anguish. Among this gem’s many virtues the one quality that gives it an absolute stand-out stamp are the performances. I don’t think I’ve seen a more accomplished complete and engaging ensemble cast in any film. Taken from theatre and television these are actors who haven’t acquired the cocky arrogance of stardom. They breathe life into their characters even as the characters suffocate in the cramped polluted environment of Mumbai. Each of the five protagonists is played memorably. It would be unfair to single any one performance, they are all so vividly in-character it doesn’t feel like a camera construction at all. Shyam Salgaonkar edits the multitudinous characters and their rapidly mutating lives with a reined-in vigour. We realize these are people on the move. But the narrative won’t humour or heckle their with hecticity. Adding substance to the performances is the care taken to write the characters into situations that contours their eccentricity in a city that disregards individuality and celebrates anonymity. We feel their unbearable darkness of being with a clarity that can only be defined by the darkness that surrounds these lives. There is Arjun Anand whose relationship with Kavya grows when he starts babysitting her dementia-ridden father (Shiv Subramaniam). Barun Sobti and Shahana Goswami (who often reminds me of Kajol) play Arjun and Kavya with such warmth and candour it feels like they are a couple I know first-hand. Sure, their shared affinity is memorable. But the footloose womanizing Rashid (the very convincing Avinash Tiwary)’s growing closeness to the abandoned wife(Rasika Duggal, whose smile lights up every frame) and mother is equally compelling. Both the romances plough persuasively into our hearts. As does the sulky musician Dominic (Vishal Malhotra)’s troubled relationship with his brother until his sunshiny sister-in-law-to-be (Manvi Gagroo)intervenes. And how can I forget the decent Parsi whitecollar boy Mehernosh (Nakula Bhalla) who can’t bear to watch his office colleague Peppy (Pallavi Batra) being abused by their boss. Finally there is Jayesh (Jay Upadhyay) the Gujarati businessman stifled by his commodious family’s noisy religiosity. When Jayesh has a sudden meltdown we are unprepared for it. It’s like thatmouse in the randy Rashid’s room which shows up to remind him of the disturbances that lie underneath the hard-earned calm and routine tenor of Mumbai. You can ignore the rats only as long as they don’t eat into your urbane composure. This is a film whose characters I carried with me long after the film was over. Every actor, including the unknown Rama Joshi who plays Vishal Malhotra’s harried mother, and Meher Acharia-Dar who plays Arjun’s sprightly temperamental sister, is an unsung hero in this gem of a film that must be seen. But if you ask me the one real hero that stands tallest in this film of looming achievements is the writing. The sharply but unobtrusively-drawn characters and the intriguingly spot-on situations and words that they exchange will have you wondering where you’ve met all these people before and eavesdropped on conversations that happened while you were travelling. While you figure that out, please excuse me. I must see the film again.